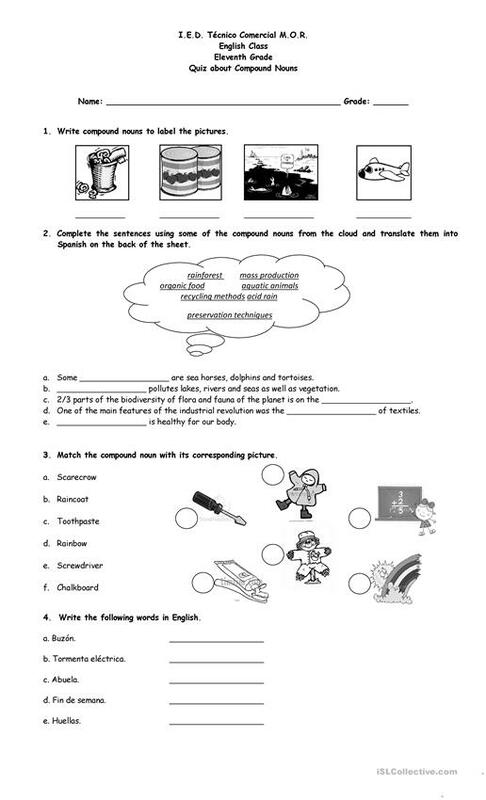 It contains four activities to increase vocabulary about compound nouns and to understand how they are made. This downloadable printable is a great resource for elementary school students at Beginner (pre-A1) level. It is great for revising Nouns and Nouns: Compound nouns (e.g. bus stop, washing machine, haircut) in English, and was designed for honing your learners' Spelling skills. It focuses on the topic and words of Environment. ALSANCHEZAREVALO is from/lives in Colombia and has been a member of iSLCollective since 2012-08-26 18:53:46. ALSANCHEZAREVALO last logged in on 2019-02-22 02:32:54, and has shared 1 resources on iSLCollective so far.